Crystal Rainbow Blue 6mm Czech Fire-Polished Drop (4) - Add 1 – Crystal Rainbow Blue 6mm Czech Fire-Polished Bead to a ball pin. Make a 90º bend in ball pin above the bead. Using round nose pliers hold the ball pin near the angle and bend it around the pliers to make a loop. Wrap down around ball pin creating as many coils as you can. Trim any extra. Repeat 3 times. Amethyst 6mm Semiprecious Round Drop (4) - Add 1 – Amethyst 6mm Semiprecious Round to a ball pin. Make a 90º bend in ball pin above the bead. Using round nose pliers hold the ball pin near the angle and bend it around the pliers to make a loop. Wrap down around ball pin creating as many coils as you can. Trim any extra. Repeat 3 times. 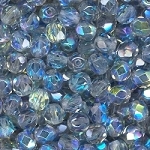 Crystal Bermuda Blue 8mm Bicone Drop (4) - Add 1 – Crystal Bermuda Blue 8mm Bicone to a ball pin. Make a 90º bend in ball pin above the bead. Using round nose pliers hold the ball pin near the angle and bend it around the pliers to make a loop. Wrap down around ball pin creating as many coils as you can. Trim any extra. Repeat 4 times. Crystal Magic Purple 10x12mm 3-Petal Flower Drop (2) - Add 1 – Crystal Magic Purple 10x12mm 3-Petal Flower Bead to a ball pin. Make a 90º bend in ball pin above the bead. Using round nose pliers hold the ball pin near the angle and bend it around the pliers to make a loop. Wrap down around ball pin creating as many coils as you can. Trim any extra. Repeat 1 time. 1. Open one 5mm Jump Ring; add 2 - Crystal Rainbow Blue 6mm Czech Fire-Polished Drops and the loop of the dangle earring. Close the Jump Ring. 2. Open one 5mm Jump Ring; add 2 – Amethyst 6mm Semiprecious Round Drops and the 5mm jump ring you added in Step 1 between the two Crystal Rainbow Blue 6mm Czech Fire-Polished Drops. Close the Jump Ring. 3. Open one 5mm Jump Ring; add 2 – Crystal Bermuda Blue 8mm Bicone Drops and the 5mm jump ring you added in Step 2 between the two Amethyst 6mm Semiprecious Round Drops. Close the Jump Ring. 4. Open one 5mm Jump Ring; add 1 – Crystal Magic Purple 10x12mm 3-Petal Flower Drop and the 5mm jump ring you added in Step 3 between the two Crystal Bermuda Blue 8mm Bicone Drops. Close the Jump Ring. 5. Repeat Steps 1-4 for the other earring.